On this date in 1969, Sirhan Sirhan was condemned to the California gas chamber for assassinating Robert F. Kennedy. As a result, Sirhan Sirhan remains alive as of this writing, serving that sentence in the Golden State’s Pleasant Valley State Prison. He’ll be next up for parole in 2011. Although the guy was seen in a crowded room pulling the trigger (onlookers tackled him) and he subsequently confessed to the deed, there has long been a conspiratorial counternarrative suggesting that other shooters were there, too. It’s pretty hard to say that the guy who emptied his chamber in front of dozens of witnesses wasn’t involved, but there are versions of this where he’s a Manchurian Candidate-style hypnotized patsy. Politics: much more interesting in the 1960s. That really seems a bit much. Sirhan Sirhan himself has contributed to the trippy theorizing about his case by being all over the map on it. At one point, he attempted to plead guilty and draw the death penalty; the trial judge forced him to go through with a defense. Subsequently, as noted, he’s whinged for an early release. He’s claimed to have had no memory of the attack, which certainly isn’t what he said after he got arrested. 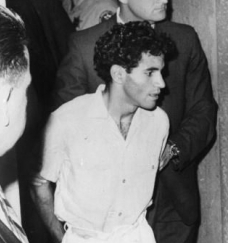 Sirhan was a Jerusalem-born Palestinian dismayed by Israel’s success in the Six-Day War, and by America’s concomitant foreign policy tilt towards Israel. Kennedy was a strong advocate of that policy, and his death happened to coincide with the anniversary of war. Maybe that’s just what they want you to think. But it has to be allowed that the cause in question has claimed more lives than just RFK’s. * People v. Anderson, decided by the California Supreme Court. Later that same year, the U.S. Supreme Court would issue Furman v. Georgia, which would have had the same effect for Sirhan Sirhan. Thinking of the girl in the orange polka dot dress, Lisa? I’m not a conspiracy theorist, but she does make me wonder. Wow – so many problems with this piece I hardly no where to begin. First, Sirhan is right – Bobby would not have approved, and we know this because Ted Kennedy himself pleaded for Sirhan’s life to be saved, in writing, based on what he thought Bobby would have done. Second, Sirhan was an American who had been born in Palestine. But he was a Christian, who grew up and went to schools in Pasadena, California. As for the “trippy theorizing” about the case, add the LAPD to the conspiracy theorist list. Because they wrote the FBI in the 1970s that if the FBI’s photos of “bullet holes” were really bullet holes, not possible or probable bullet holes, then the LAPD needed to be looking for a second shooter.